Press play below to begin slideshow. Thank you to all who participated in this challenge. The creativity is amazing. Whoooo knew? Please check out the pictures in the slide show. Inspired by the McGown Chicken Challenge we offered this year's hook-in registrants a chance to participate in our Saw-whet owl challenge. The finished 14x14 mats were displayed in the rug show at the hook-in. 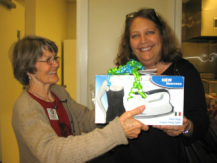 CONGRATULATIONS TO Ellen Dolmetsch, our iron raffle winner. Profits from ticket sales will be donated to the 2013 Biennial fund raising effort.